Over the past 20 years, Siegrid and Klaus Ulrich Helmert have used their own individual ideas to transform what was once a kitchen garden and orchard into a garden with a special appeal and atmosphere. The site, covering 6000 m2 and running down as far as the village millrace, stretches out behind an old, carefully restored half-timbered house dating from 1633. The space is divided into three main areas. Traditional elements of garden design are used, but are always adapted to the owners’ individual concepts and ideas for use. Two formal sections near the house are succeeded by a larger, landscape-style part with various spatial divisions. The whole garden is characterised by a rich variety and wealth of plants, carefully chosen to harmonise with each other in terms of size, colour and shading. Roses can be found in every section. Most of these are old species, ramblers and wild roses, many of which are allowed to develop unrestrictedly, thereby transforming large areas into masses of blossoms in June. To these are added herbaceous perennials, a further valued and well-tended element of the garden. They are left untouched right into the winter, thus revealing the charm of transience. When the Helmert couple were considering and planning the transformation of what had until then been a kitchen garden, they did not regard it as a question of assembling rare plants or of attempting to be original in terms of landscape planning. It was, rather, a case of realising ideas which they had developed themselves. 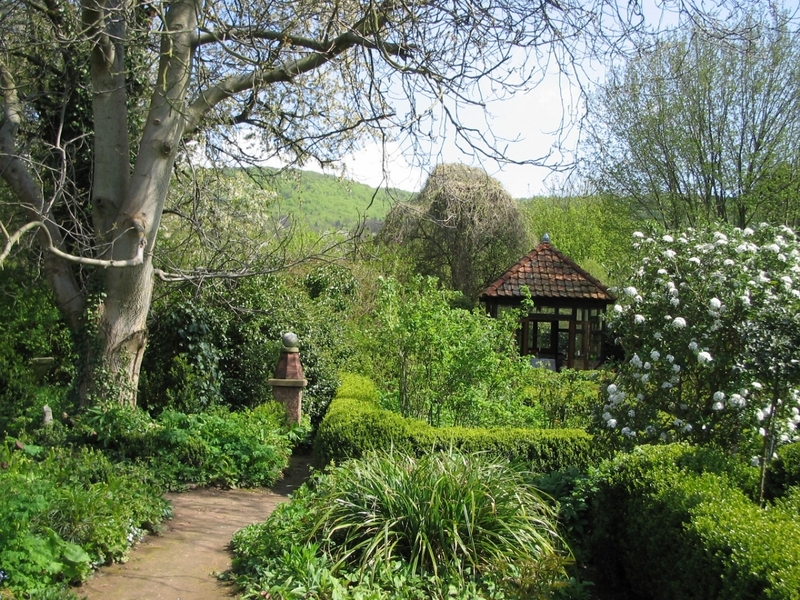 The desire to create a garden with an individual character and a special atmosphere arose against a backdrop of horticultural experience and the study of specialist literature. Childhood memories of a seemingly enchanted piece of land with a rose walk belonging to their grandparents also played a role as did, for example, knowledge of English garden designer Gertrude Jekyll’s colour composition principles and their own intention of including the existing stand of trees in the new garden. The garden has developed into the central focus of life of the Helmert family over the course of its intensive creation and care, both of which have been carried out with remarkable enthusiasm and without any significant help from outside. It contains many idyllic spots for relaxation and rest as well as places for eating and entertaining guests and is often used all day long. The “formal garden” is reached by crossing the courtyard to the side of the house and passing through an arch covered in greenery. 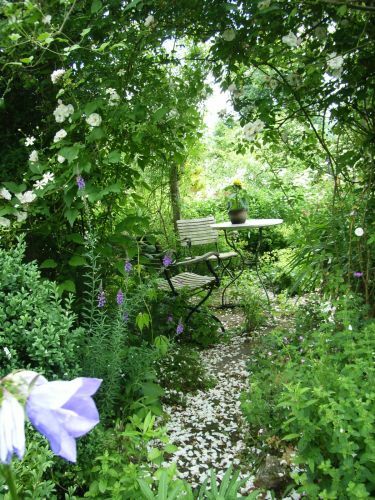 An impressive white rambler rose growing up and over an old pear tree creates the right emotional mood for the forthcoming garden experience. The “formal garden” consists of a cross-shaped network of paths and rectangular flowerbeds surrounded by box in keeping with well-known, straightforward patterns. This simple basic structure is masked by an overwhelming profusion of plants which gives this area of the garden its own individual character. Herbaceous perennials, grasses, ferns and flowers are planted along the paths and in the squares formed by the slightly recessed, tall box hedges. While the various plants often grow into each other, the result is not chaotic confusion. Care is taken to ensure that the not too bright colours and shades harmonise so that a pleasing overall scene is created. Trees and bushes create a border framework while objects or places to sit provide visual focuses at the ends of the paths. All in all, the garden has numerous places for sitting which provide constantly changing perspectives and enhance the pleasure of spending time in it. The succeeding “rose garden” is located somewhat to the side. It also has a formal basic structure with a central path which widens out at a round flowerbed. However, the strictness of the structure is softened by the dense box hedges, which are waist-high here. The collection of 50 old species of rose is one of the highlights of the garden in June when the roses are in flower. A summer house made out of old building materials and designed by Klaus Helmert himself marks the end of the path. In contrast to similar old structures of this kind in the town gardens of the region, the summer house is completely made of glass above the base wall. Apart from the resulting uninterrupted view of the green surroundings, the summer house makes it possible to stay in the garden for longer periods in cold weather as well as in spring and autumn. The landscape-style area known as the “grass garden” is much larger than the formal areas and is screened from these by trees, bushes and hedges. Entering it through a gate covered in roses and scented honeysuckle thus provides the visitor with a moment of surprise, the view opening out onto a large space divided up in various ways. The old stock of trees and the bushes in shaded hues are often overlaid with climbing plants and are covered time and again with roses. These trees and bushes surround the different sections and provide screening at the edge of the grounds in some places whilst facilitating views of the surrounding landscape. The individual areas are loosely connected and designed in different ways: there is garden furniture in the “summer living room”; elsewhere there is an old shepherd’s cart, a large stone table for family meals or, in the “pot garden”, numerous pots of all sizes with plants arranged in a large variety of ways on various stones and ledges. One element of the garden becomes visible here. It is one of its most characteristic components and can be found throughout it in great variety and originality: the placing of all different kinds of objects as decorative additions or in order to accentuate certain points. This intentional and deliberate course of action does not, however, mean that the element of chance is ruled out or that things are not allowed to do their own thing, as it were. Thus, for example, seedlings are given a chance to grow before a decision is made on their further existence. Or a fallen willow is left as it is so that new life can sprout from the rotting material and become part of the garden. Opening times: This private garden can only be visited by appointment. The owner will welcome individuals and groups of up to 25 people on a guided tour. Accessibility: Caused by unpaved paths this garden is not suitable for people with limited mobility.